Lynch Creek Dahlias: Dahlias Near the Arctic Circle? YES! 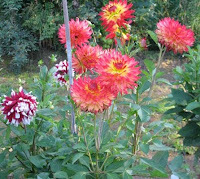 We thought it was pretty neat when Shiloh McCabe shared photos of her luscious dahlias grown in Anchorage, Alaska. 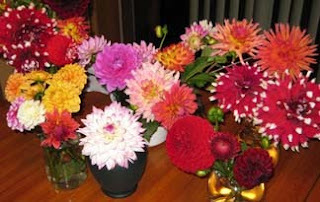 But 370 miles farther north, Sonja Benson and her fellow dahlia lovers grow bunches and bunches of beautiful dahlias in Fairbanks, north of the Alaskan Range and not all that far from the Arctic Circle. 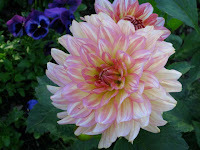 It takes some doing, Sonja admits, to get from tuber to flower in a short season, and last year was the first time she ordered a lot of dahlia tubers (from Lynch Creek Farm!). "Before that," she says, "it was just extras from friends." She and other Alaskan dahlia growers take advantage of the long days of summer, but it's a short growing season outdoors, so they have to start their dahlia tubers in pots indoors, and find that by mid-September, the growing season's over. In Fairbanks, she explains, the last frost is usually sometime in May, so most people start their garden plants indoors as early as February (some tomatoes) or in cold frames in April or May. "We need to get a jump on the season; we can have frost as early as August, and sometimes a fluke event in July makes us run out and cover our gardens with tarps," she explains. "I cut and pulled all my dahlias last year on September 21 after our first hard frost. Because I didn't get them started till late April, there were some that never bloomed. I found the differences in the plant heights from what was stated in the catalogue very interesting—our cool temperatures but very long days had a different effect on different varieties; some were gigantic!" To store her dahlia tubers and protect them against the cold of an almost-Arctic winter, Sonja puts them into her basement crawlspace, wrapped well in newspapers and grouped by variety in plastic grocery bags, loosely tied. "That has worked in past years and I'm hopeful for this one," she says. It's work, yes, but as a relative newcomer to dahlia gardening, Sonja finds it amazing and rewarding to see the results in her expanded dahlia garden. "At the end of the season I was cutting like crazy, giving them away, bringing bouquets to work," she said. She invited friends to come out and cut their own, and laden with flowers, they looked "like so many bridesmaids," she said. Like bridesmaids, indeed. 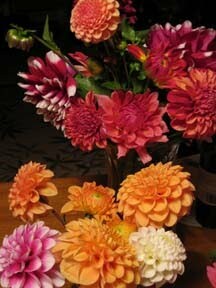 Watch for a future blog series on dahlias as wedding flowers!